When I woke up this morning I randomly had the music for Dance of the Sugar Plum Fairy playing in my head. It was about this time last year that I started searching for good “holiday” reads (Halloween and Christmas), and this year I seem to be doing the same. Last year I planned it but this year it’s happening in a more spontaneous way. I know that Dance of the Sugar Plum Fairy is from Tchaikovsy’s score for The Nutcracker, a Christmas season favorite with a tradition as strong as A Christmas Carol. 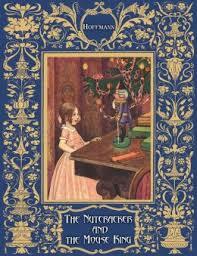 I also know that the ballet was based on the book The Nutcracker and The Mouse King. Sometimes before reading a book I like to do a little research on it and I was very surprised to find that The Nutcracker and The Mouse King was written in 1816! That is amazing. The story is 200 years old….. That is just absolutely amazing. A few years ago at Christmas I borrowed it from the library and tried to read it, but I couldn’t get into it. So, I’m going to try again this year. The Nutcracker and The Mouse King is officially at the top of my Christmas-books-to-read list. I’ll try to start it no later than December 1st. Wow, here I am talking about Christmas and December and it’s only the middle of August! But, hey, Book Talk is Book Talk, it doesn’t always recognize seasons. As for right now….. Still not reading anything, although I do keep thinking of David Copperfield. I’m also thinking of Halloween and what I should read for the month of October. Last year I decided on The Wolf Gift for my “Halloween” read, but I wonder what I’ll read this year…? I gave Dracula a try last year, it was very difficult, but I would be willing to try again. Maybe I’ll find something entirely new. But definitely nothing by Stephen King. No Stephen King! I can’t handle his horror stories. Hmmm… let’s see….. I think I’m feeling kind of “witchy.” I might have to do some research and find myself a witch story or two to read- there’s plenty of them out there!